Q: I accidentally uninstalled the Slide Show gadget in Windows 7, and now the Slide Show gadget is gone. Where did it go, and how do I get it back? A: Windows 7 offers several “gadgets” — small programs you can embed atop your desktop. One gadget displays a clock, for example; another displays a small slide show of the photos in your Pictures library. 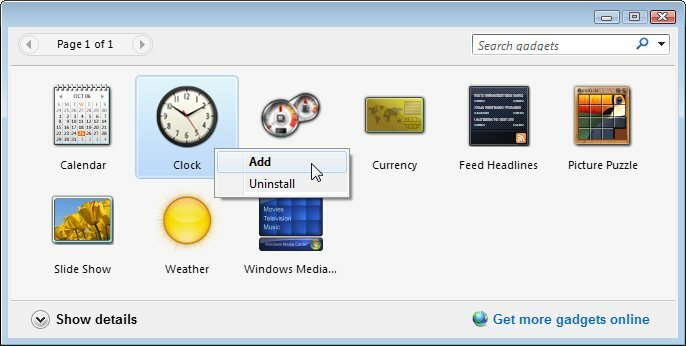 To see Windows 7’s built-in gadgets, right-click on a blank part of your desktop, then choose Gadgets from the pop-up menu. Spot a gadget you like? 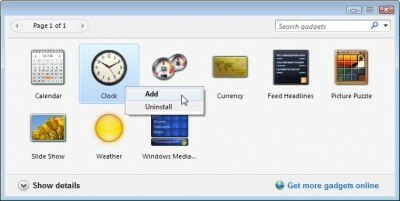 Right-click its icon, and a pop-up window offers two options: Add or Uninstall. Choosing “Add” places the gadget atop the desktop. And clicking Uninstall, as you’ve discovered, removes the gadget from the window entirely. All of the original Windows 7 gadgets will return, including your missing Slide Show gadget. Posted: December 29th, 2010 under Windows 7. Thank u. I could restore the uninstalled gadget with your instructions. Thanks for this page. I lost my slideshow & couldn’t remember where to get it back.